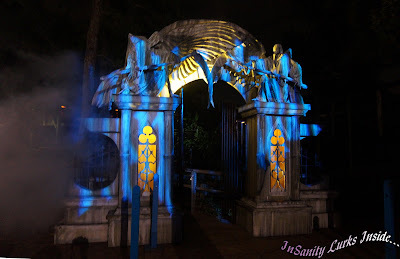 Where: Busch Gardens Tampa- Tampa, Florida. Recommendation: Worth the Price, Go if your in Florida. 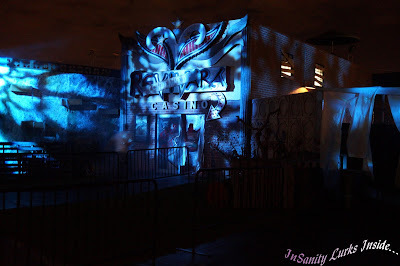 We where invited to Howl-O-Scream's Media Event, as part of this we where given a few perks in return such as front of the line passes and two free drinks. 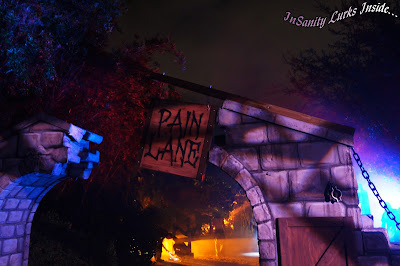 As such we where able to visit every house and scarezone to give you the best review possible. Busch Gardens also asks that we remind you, this is not an event for small children. Upon entering the park you get no break, no time to make your plans because your very first encounter with the "13 Evils" begins the moment your inside. 13 Doorways for 13 Evils, the scarezone is just as you enter the gates and the actors who portray each are absolutely excellent at their parts. They are high energy, in your face and just as fully twisted as their characters. It's truly an excellent opening and sets the tone for a great event. 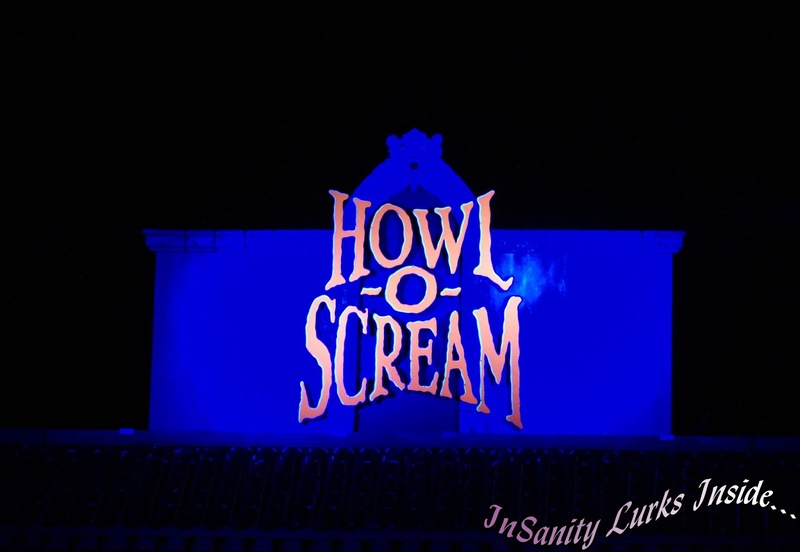 Howl-O-Scream 13 is a great event and the new theme for this year "13 Evils" works excellent for the park. The new theme and the re-design of some of the older houses just works, it's bumped the event up highly in my opinion from the last time we saw it 3 years ago. 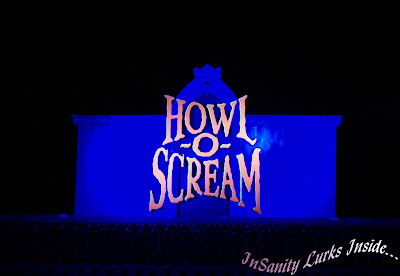 However, I have a few minor issue with the event which seems to be a problem with both Howl-O-Scream events in general. While the houses in Tampa where all well done and excellently themed, the clowns just need to go. Nothing about that haunt is scary and most of it falls into the realm of just plain annoying. If your looking for a house to skip, make it the clowns because it's not worth waiting more then 15 minutes maxium for. My second issue was the scarezones, which desperately need more actors in them. 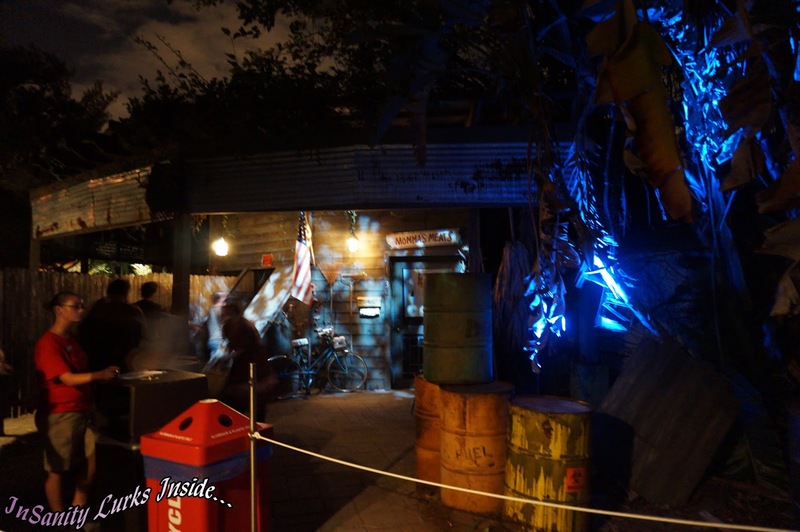 Now, I can't tell you if this was "first night" problem or not but these areas are well themed and they should be staffed by far more people. If that happens, I'd rate them as excellent and bump the park's rating up to Excellent. However, as I saw it.. their grossly understaffed. Below I'm breaking out the event into two categories: The Houses and The Scarezones. This is to not only keep things straight in my own mind but to allow the reader an easier time. Each "House" will be giving a rating and description along with letting you know which of the "13 Evils" can be found there. In an effort to keep the scares a secret for your future enjoyment, I will be rather vague but shall attempt to explain as much as possible. Read on for a FULL breakdown! 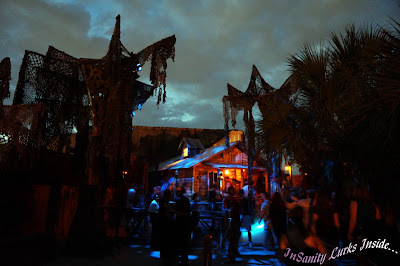 Let be just begin by saying the Howl-O-Scream creative team went above and beyond with this haunt, as you approach it you really feel as if your entering a backwater Bayou. Actors randomly wander through the line, scaring and shouting to you the warnings to keep away from the Voodoo Queen. As you approach you really feel the themeing come to life, between the fog and the lights you really get the impression of entering a swamp house where nothing good will be happening. 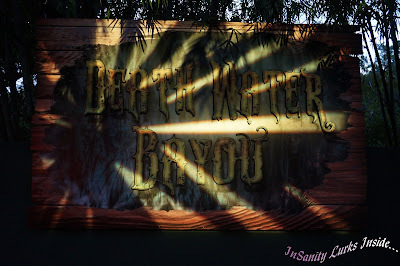 Inside you encounter the Voodoo Queen herself while moving through a series of Bayou scenes from the wooden shack, into the swamplands and all the way through a funeral procession. This house is just brimming full of actors and all of them are after your, many from directions your not even thinking of such as above and below you. Even the statuary isn't safe inside this haunt! The length is good and the actors are excellent, it's worth the time in line to see this haunt! My one gripe about this house is the fact we didn't actually spot "The Psychopath" inside. This could be an oversight by us or perhaps he just wasn't as visible as we expected, either way the haunt was still very good! Inside Blood Asylum you'll find a crazed collection of lunatics who are now running the nuthouse. Located inside the old Cyldesdale stables you'll be twisted and turned backwards while wondering through the often narrow and gory halls inside. The actors have really taken their rolls to heart, you'll find your typical 'torture' patients but your also going to encounter people acting truly crazy. One lovely young lady in a straightjacket was babbling math problems and demanding your answers! This is the kind of detail often missing inside 'asylum' themed haunts which really gives Blood Asylum an edge from "okay" into "very good". Here we where also very pleased to see the scares coming from all heights and angles, they'll be at your legs and above your head lending an air of confusion and an utter lack of nothing being safe. This haunt also has a good length, just long enough but it doesn't leave you wanting after the end. Clowns. Again with the clowns! I'm so damn sick of clowns in 3D I can't even put it into words! Yet that's exactly what we found at Circus of Superstition 3D. We had slightly higher hopes for this haunt since "The Clown" isn't your typical side-show fellow but rather the deranged 'sad french clown" type but that isn't want we found inside. Inside it's exactly what you've come to expect, annoying people dressed as clowns jumping out with horns and giggles. Garish colors and the same boring effects every other "Clown House" employes. 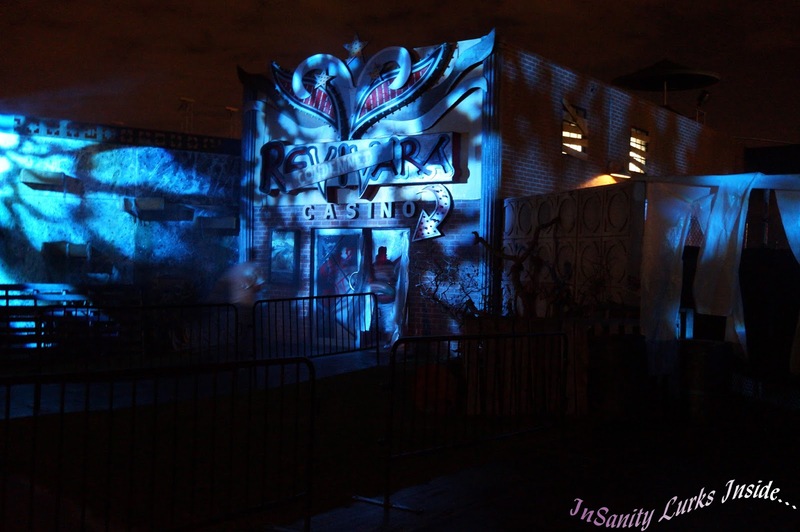 The one highlight to this haunt was the fact they also using different levels to try and get scares. Above and Below you had actors attempting to get people to scream, one good effect was a clown in a rocking chair well above your head. This was the only nice touch I can really comment on, the rest was dull and slightly headache inducing from the blaring of carnival music and clown horns. We didn't see anything like "The Clown" evil suggested we might see, it's your typical carnival/side-show business. This is the one house which we noticed didn't have an abundance of actors, hopefully this means it won't be making an appearance next season. I'd suggest you see if but personally I wouldn't wait more then about 15-20 minutes in line. 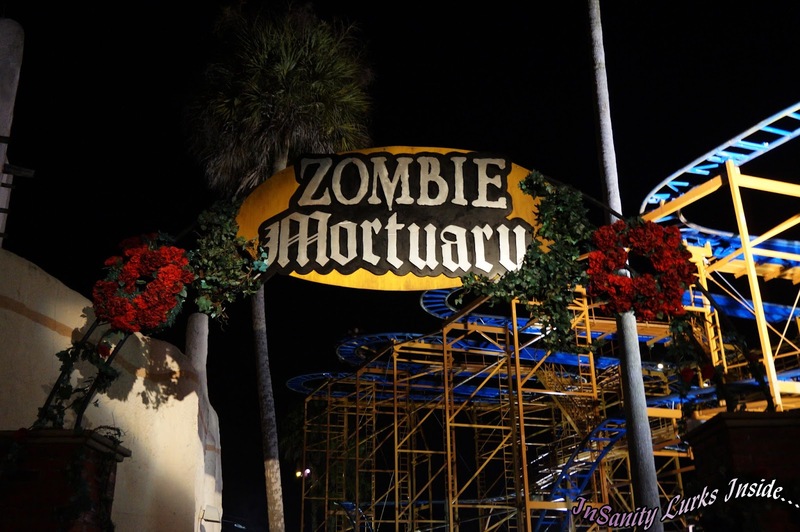 Zombie Mortuary is a haunt that doesn't have anything to do with the "13 Evils" and is a re-fresh from past seasons. However, don't let that full you this haunt is worth the time to visit. 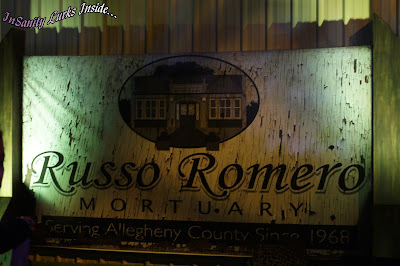 Inside your going through a funeral home and mortuary that's been overrun with the living dead and many twisted folks still working the place. 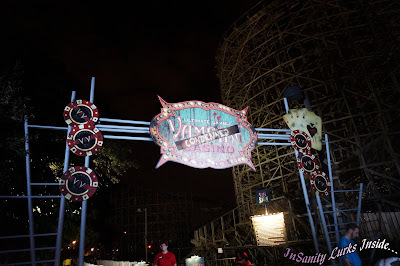 The themeing inside is great, it gives you a lot more then your expecting from the name. You'll be traveling through much more then just a funeral home, you'll visit the mourning rooms, the casket room and even the back alleys behind the place. Inside things aren't what they appear and your going to be in for a surprise as once again many angles are used to misdirect your attention lending the scares some extra power. Your not sure what's real and what's false and it's a sensory overload. The little details are really what makes this house go beyond an "Okay" rating and pushes in right into "Good". The actors are plentufyl and very good, not often where you expect them to be. 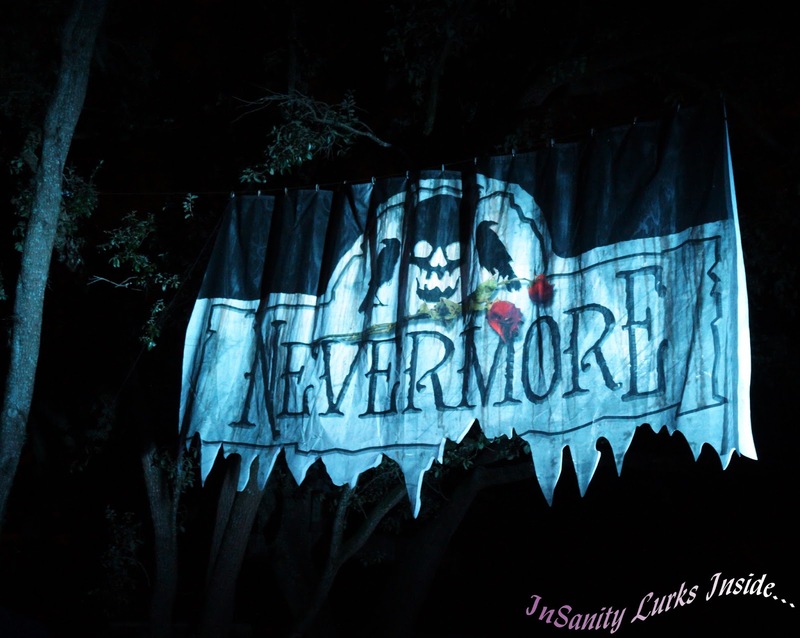 Nevermore is themed after a the works of Edgar Allen Poe and inside you'll find many of his stories and poems come to life. 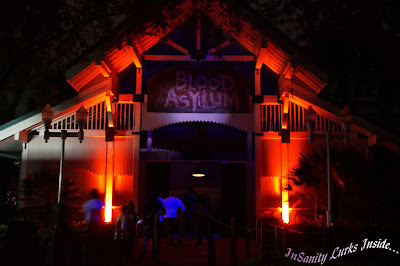 While this haunt has nothing do with the "13 Evils" it's still a good haunted house which I'm happy Busch Gardens kept around. Walking through the pages of Poe's works, if your familiar with Poe you know what's coming but it's done in a way you wouldn't really expect. From the beating of the TellTale Heart to the crying of the Raven, Nevermore delivers an unexpectedly creepy haunted house. The themeing inside is simply excellent, dark and dank where it needs to be and the creep level is enough even to give my jaded self a little shiver of anticipation. From loud and bright to dark and enclosed this house delivers scares and chill with each step to take inside. The actors are really what brings this house to life. 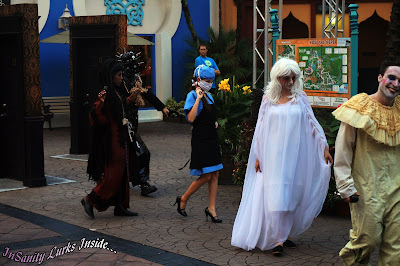 While not overly full of actors, they are found in the right areas and really work to give you a scare. Vampire Casino: Condemned is another haunted house which has a running theme with Tampa's Howl-O-Scream event. Personally I'm not fully up on the 'story' behind this haunt so we didn't follow the storyline taking place inside. That doesn't mean it's not a good haunt, we just didn't understand it since we haven't visited this event for 3 years. Walking into a Condemned Vampire Casino is something of a crazy experience. It's been taken over my the Werewolves and their not one bit happy to see people coming into their new territory. Inside you'll find all the glitzy glory of a casino that's gone straight to hell then to the dogs, literally. You'll wander through poker rooms, slot machine parlors, the kitchens and even the once up-scale shops this haunt once boasted. Each and every area is crawling with werewolf actors out to chase you from their new home. I'd watch out for the wedding dress if I where you, it's packing a surprise! They come at you from all angles, below and above, your never sure exactly where one is going to pop out of next. In this haunt we found a lot more 'classic scares' then in the others such as drop windows and curtain scares which was a nice touch. Between that and the many sound effects going on your senses really get a workout even if your not fully following the story behind the house. The Basement is home to one of the "13 Evils" called the Butcher. He's not alone as this haun ast it also home to his lovely and very twisted family. All of which work at their own slaughterhouse-gone-wrong called "Mama's Meats". 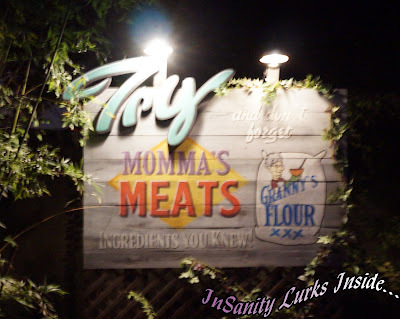 Mama has gone crazy along with her son 'The Butcher' and inside your going to get an up close and very personal tour of their family business. Stepping inside The Basement your going to have a fun little head-trip. This is the stuff nightmares are made of and your probably not going to look at the deli counter of your local grocery store the same way afterwards. You enter from the back, straight into the chaos of Mama's Meats. From the store to the slaughter areas your going to see it all and each area is filled with some twisted employee or family member who wants to make you part of the food supply. I'd make sure you don't touch the jars, it's just not a good idea! The actors here are simply excellent and they play out their characters amazingly well. Not everyone is out to scare you, some are there to mess with your mind and easily misdirect you right into the next area. 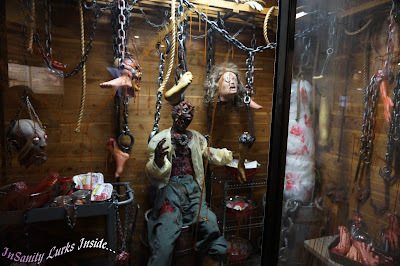 The themeing in this house is amazing, the little details (like brains in a jar) are all present and really set the atmosphere for the actors to play with. With both narrow and wide areas, this house just works on all it's twisted levels. Honestly, I'm not sure what exactly this Scarezone has to do with the overall theme of Howl-O-Scream. 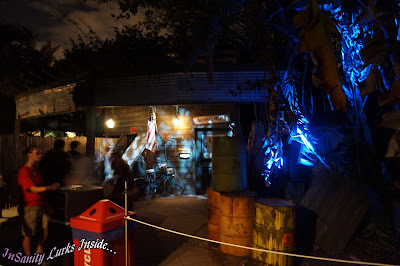 My main gripe is the fact this scarezone was very dead, it had all of three actors in a long pathway area. Apparently the theme is something about sadistic scarecrows in the fields having come to life and being after humans? I'm not really sure but that's what the map said! Between having almost no actors and not fitting into the overall theme of the event, I just couldn't enjoy the area. Although I will say I liked the person hiding in the hay stack, that was rather unexpected overall! Pain Lane was suppose to be home to two of the '13 Evils'. The Torturer and The Hangman, the only one I spotted when we walked through the area was the Torturer. 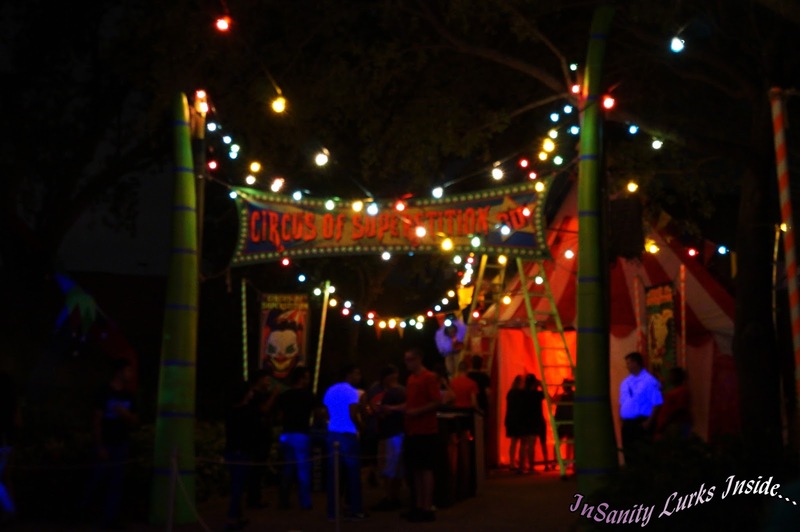 While this scarezone fits perfectly to the theme and is very well decorated for a pathway scare, it was also rather devoid of actors. We counted four people, including the person playing 'The Torturer'. Again, this could be an issue with visiting the first night but this area has a lot of potential but it just needs the actors to make it work. This area should be crawling with actors out to make your nightmares come true, what we saw was a nicely themed pathway. 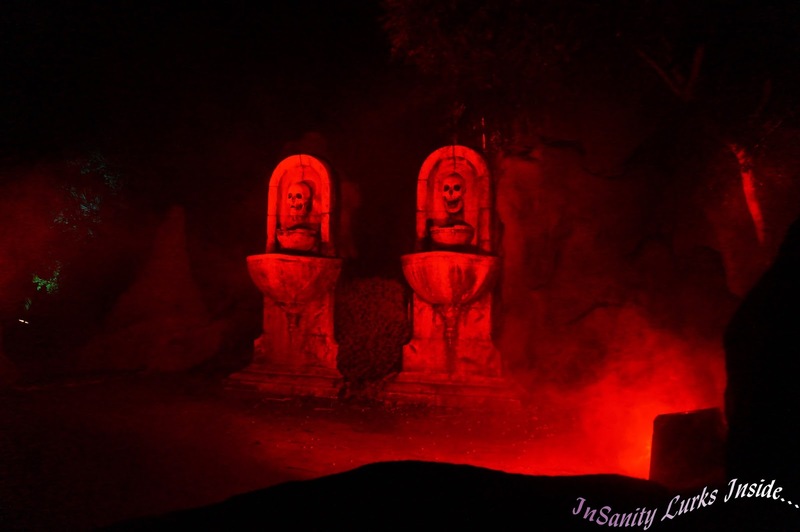 Easily the best scarezone in the park and the only place one can see all of the "13 Evils" unleashed upon the park. As I said in my opening, this happens the moment you walk into the park. 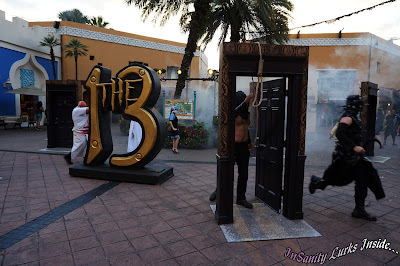 Each of the 13 evils has a presence and a doorway here, watch them create chaos! These actors where on the ball and loving their parts, each was played perfectly and brought the screams out of people. From being crazy and fun to scary and rushing, this is one area that doesn't lack for actors. While the theming isn't great you don't honestly need it when you've got 13 people running wild through your entrance plaza, the only downside is that I wish this area could have been bigger or simply had more involved in it. They themed the gift shop! That makes me joyously happy to see and it's well done also! 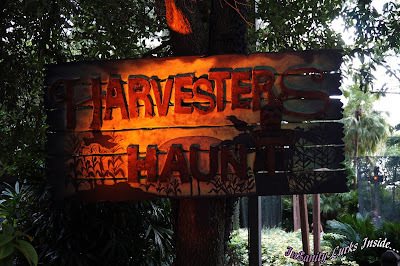 Inside your going to find all your Howl-O-Scream merchandise plus some Halloween themed extras for sale. We where both rather pleased not only with the fact this shop was themed but by the fact the prices on Howl-O-Scream merchandise wasn't inflated. Good designs on this years offerings and the package pick-up at the end of the night is a serious lifesaver! These guys rocked! Heckling guests with sarcastic comments plus bad Halloween puns and jokes. Interactive when people will stop by them, they easily give you the laughs needed if your easily scared. We easily could have listened to them for hours if our time wasn't so short at the end of the night. Their located near Gwazi, make sure you take a few minutes out of your night to stop by and listen to them! 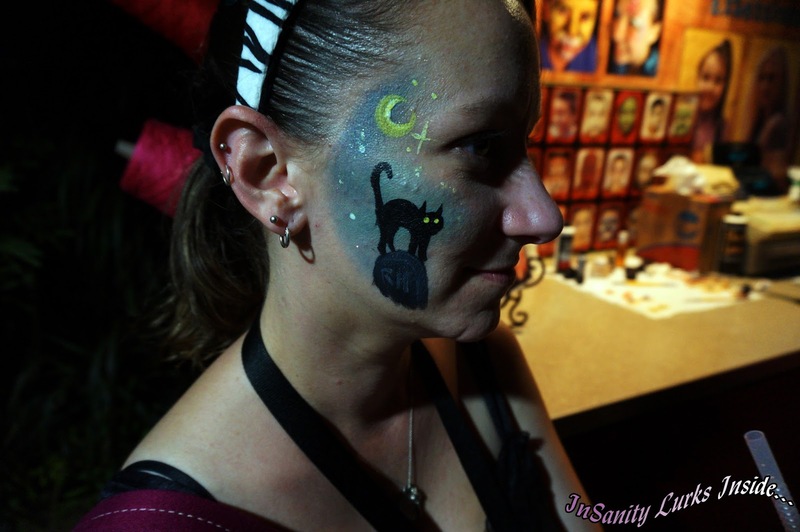 Because seriously, who doesn't like face painting!? Howl-O-Scream has face paint stands set up all over the park with designs for Halloween and beyond. They also can give you a nice collection of wounds to really get you in the mood! Try and find Gina, she does a GREAT job (she did mine) and she'll even improvise something to fit your mood! Overall we really enjoyed Howl-O-Scream. The event still needs some work but we found it a great place for some scares. If not for a few factors I'd have rated this event excellent, even as it stands now it's a damn good value and a lot of fun. 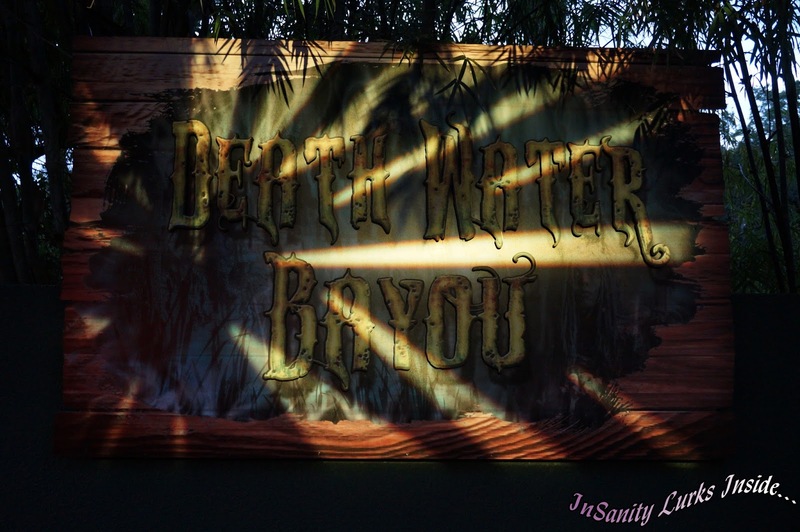 You easily get your money's worth for the visit and most of the haunted houses are worth the time in line. However, I really wouldn't recommend this for kids as it's just not that friendly of an event to bring a smaller child too.